Detoxification via deep thermal induced sweating to rid chemicals and toxins such as heavy metals and raise core temperature to mimic a fever to discourage infections. 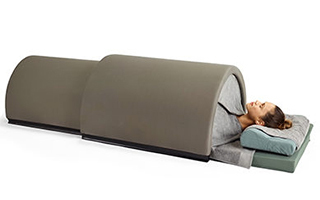 Our non invasive Suntlighten Infrared Dome Sauna is like a sleeping bag for the soul. Our unique sauna allows you to lie down and surround your body with the proven effects of Solocarbon far infrared technology, while keeping your face and head out of the heat to remain completed comfortably cool. The infrared heater warms up your body at the core rather than on the skin’s surface. Solocarbon is the only infrared heater proven to lower blood pressure, increase core temperature and aid in weight loss. The use of an infrared sauna can be an instrumental part of a detoxification protocol for those who want to release heavy metal and chemicals and environmental toxins via sweating. The benefit of using as infrared sauna is that allow you to eliminate significantly more toxin than a traditional sauna because the infrared heat can penetrate deeper into the tissues and it can accomplish that at a lower temperature than the steam sauna. Solocarbon® panels contain a unique proprietary blend of materials that are 100% quality controlled by Sunlighten™. This means—unlike other saunas on the market—it can ensure the safety and effectiveness of each individual heater. The proprietary heater design produces virtually NO EMF, (electromagnetic fields), that can be harmful to your body in large doses. What’s more, Solocarbon® panels are heat-sealed, meaning no wires or glues are used, so there is no release of unhealthy gases during heating.